My original post of “Sharon D’s Rose” was written in June 2011. As with every memory of a friend lost, I shake my head and ask how it could be that so many years have passed. Bob and Marilyn had come for tea in the garden that weekend. In my ramble around the yard before they arrived, I found a perfect stem of roses to send home with them. The shrub with the totally inadequate and utilitarian name of Winnipeg Parks had just began its blooming. I planted this rose in memory of Sharon, a mutual friend of Bob’s — and every summer since, when it’s at its peak, it outshines all the other roses in the garden. Bob went straightway to a garden centre to buy the Winnipeg Parks that is blooming now in his garden. Yesterday, clipping a bouquet to bring into the house, the memory of the spring and summer when Sharon became a gardener, flooded my thoughts. Looking ahead to solitude in her house —her first two children had flown and the third was poised on the age of the nest to leave for university in the fall— Sharon was gazing out the window one morning, she told when she called. She had decided that she wanted to turn that rectangle of back yard with its lawn and shrubs into a beautiful place. “Help me make a garden, Betty! Any fool can make a garden, can’t she?” I flashed back to a similar conversation just a few months before when Sharon was contemplating walls and called to say, “I’m tired of these walls. Any fool can remove wallpaper, can’t she?” The rental of a steam unit, and three days of labour later, another phone call. Quavery voice. “Betty, you know the layers of wall underneath the paper?” Drywall. Made soft by oh such enthusiastic steaming … But still, I knew my friend was no fool at all, but a bright spark of a poet who would bring such creativity to her gardening I couldn’t wait to watch this garden grow. First the pruning back of trees, then the digging of the beds (Sharon hired my youngest son to do the labour), the round and round my garden for plants she loved, and the digging and sharing. Then the trips to Greengate and at my suggestion of a bed of roses along the front driveway where the sun shone all day long, we reached the climax of this gardening story. 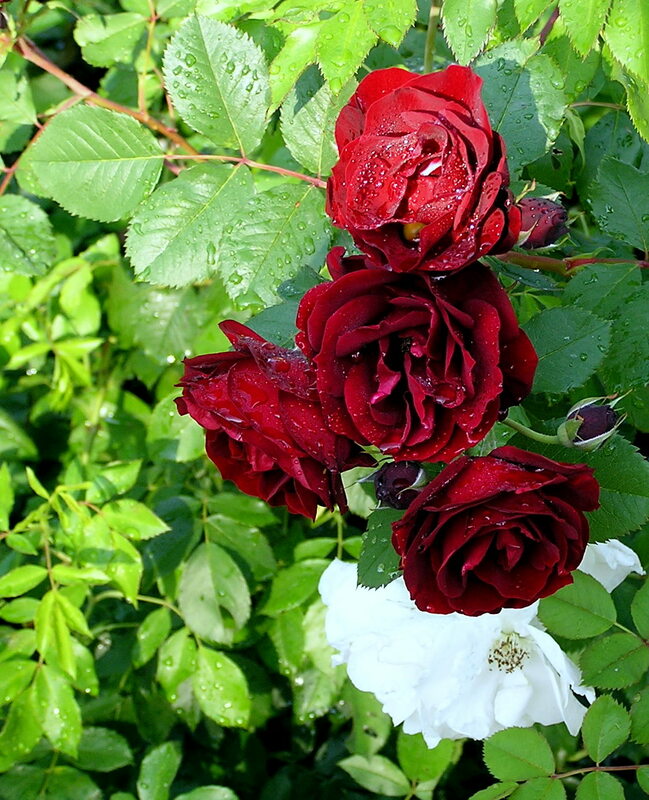 I think there were six assorted roses in the first planting, but the day the Winnipeg Parks opened its first bud, Sharon sent an email saying she was off to Greengate. She was in love with that rose, and she needed at least two more bushes. On a day in late September, I had an email from Sharon saying she’d just finished planting tulips among the rose bushes when the first snowflakes of the season drifted down. She was hooked on gardens. She couldn’t wait to see those tulips pushing through in spring. In January, Sharon died very suddenly. I think it helped that the world was covered in snow and we didn’t have to think about her garden for several months. That summer, my son tended the yard, pending the emptying and sale of the house. The tulips bloomed but were neatly decapitated by the deer that range nearby. But the roses, the roses were splendid. Each year, my intent to drive by Sharon’s garden to see if the Winnipeg Parks is still there lessens. By now, the sadness that kept me away in the first years would surely give way to joy should the roses still be in that perfect spot. But there is a good chance that whoever lives in the house now has different preferences, and they will be gone. I prefer to hold close to the memory of the excitement on my friend’s face that summer she was transformed into a gardener. This year’s Winnipeg Parks in my own garden will be enough. My garden is my sanctuary from the time blue buds on hepatica dare to appear under a dusting of snow and until the last trees finally begin to drop their leaves—the laurel leaf willow and the burr oak that seem to hold onto hope until late October or longer. This time of summer, when every plant and tree has reached the peak of its perfection, has always been the best of all. In any corner of our garden, I can find a place for a chair and a bit of loveliness to contemplate. I know that spring and summer are also the seasons of many of my stories. Rarely do I write winter and in particular the dark months. Will there be a story from this summer? Or is this endless succession of warnings— “Weather Alert! Conditions are favourable for severe thunderstorms, heavy rain, hail, and funnel clouds” —about to become the cliché for prairie summer. This summer, my garden has been less of a sanctuary and more the scene of mad dashes into periods of sunshine to weed and dead head and clean up the damage from the latest deluge of rain and hail. And yet, I’ve been in awe of the mild spring that began in April and carried straight through to summer, the explosion of roses, day lilies of spectacular size, the early harvest of vegetables and a Calgary landscape more lush and green than any I can remember. Next summer may arrive even earlier and bring weather more extreme but even so, as I watch my garden mature into its late summer beauty, I hold tight to the hope that the cycle will remain essentially the same. I’m hoping too, that the fall garden will provide its own sanctuary. As for story, I’ve written weather many times, and I suspect that will not change. Always, when she smells a storm, Jess’s heart races and she’s whirled into the eye of the tornado. She was driving cab on the south edge of Edmonton the day piles of coal black clouds rolled toward the city, bulging and heaving, gathering an eerie jaundiced light. When the car began to buck in the rising wind, Jess turned it around, driving furiously toward the edge of the storm. She hesitated when she saw a man at the side of the road braced against a mileage sign, his hair, his jacket, the legs of his jeans plastered to him. A glance at the sky in the rear-view mirror and her foot hit the brake. She pulled onto the shoulder, backed to where he was standing and flung open the passenger door. Both man and door were almost ripped away by the wind before he pulled himself gasping into the car and heaved the door shut. Jess put her foot to the floor, instinctively heading for home. They were silent except for Brian’s ragged breath until a tight black funnel came spiralling out of the clouds. “Jaysus! Is that what I think it is?” His voice was muffled in the thick heat. “Perfectionism will ruin your writing, blocking inventiveness, and playfulness, and life force (these are words we are allowed to use in California. )” Anne Lamott from Bird by Bird. This is one of the books I’ve always recommended in my introductory creative writing classes as much for what it says about perfectionism as for the notion that some of us in some places are not as free and easy with our words. I’ve long been aware of self-censoring not just subject but word choice depending on to whom I’m speaking. Obviously, we all do this. Sometimes it has to do with the context within which I know people, other times it’s simply my own reluctance to reveal more of myself than I think that particular person needs to know or may be comfortable knowing. This comes from a lifelong need for privacy and a longstanding shyness that I’ve worked most of my adult life to “cure”. Mostly it’s words that come from a deeper place inside me that I’ve used guardedly.There have been people in my life with whom I have been totally easy with speaking words like “faith,” “grace,” “forgiveness,” “prayer,” “worship,” the gentle words that sometimes cause other people to look at me as though I’ve been hiding something from them. Then, too, there are the words like “obsession,” “jealousy,” “envy,” “resentment,” and some others that live on the dark side of writing. But this is not meant to be confessional, but rather another conversation about my garden. And when it comes to my garden I have no restraints on describing the miracles it contains. I have been mumbling and grumbling about the amount of energy this wild garden of mine demands and how I need to change it, make it manageable, low maintenance. So, I have been culling, taking out plants I’ve never really loved but just kept adding because I’ve been an obsessive collector of plants and somehow had the notion that there should be no dirt showing in a flower bed. But now, there is earth between the plants I do love, the invasive species have been torn out (well… I’m working on it), and the coloured foliage of quiet well-behaved plants that were hidden under a great leggy circus of show-offs is visible and beautiful. Soon I’ll be ready to lay down an attractive mulch as carpet for this new art I’m creating. Yesterday, a neighbour who frequently walks by stopped to chat, and said she loves this new look in my garden. She loves the serenity. Yes, I thought! That’s what it is I’m seeking from this garden – not low maintenance, not xeriscaping, but a quiet serenity that is pleasing to the eye, and the soul (another word I tend to avoid J) and that demands no more than the amount of available energy I can summon to tend to it all. There is still a long way to go, and I will keep on recycling plants to the back alley for neighbouring gardeners who are seeking to enhance their kaleidoscopes of colour, but serenity doesn’t come quickly and easily and I think the garden is just the first step. I decided some time ago that I did not want to be a reviewer of books. I’m a hyper-critical reader, and while I know that there are always some positives to draw on —if a book was published by a reputable press, it has merit no matter what my tastes or biases—sometimes it’s just hard work. And when I really engage with a book, I’m often inclined to just want to savour it without pondering why. However, when I was offered a gardening book for review right in the midst of hands-in-the-dirt and heard the title, No Guff Vegetable Gardening, I didn’t resist. I’ve been growing vegetables since I was old enough to drop chunks of seed potato into the cleft in the earth made by the spade of the adult I was following. At a family gathering a few years ago, a cousin I hadn’t seen in years asked me if I had a garden. He remembered my mom’s garden so vividly, he said. I knew he was not nostalgic over geraniums or dusty miller, but was recalling the long rows of peas and beans, the hills of potatoes, and the first crisp radishes of the season. I was almost embarrassed to admit that my “garden” is primarily tall trees, a pond, pathways through perennial beds, and only a few raised beds in sunny corners for the greens, pole beans and tomatoes that are the sum total of the vegetables I can successfully grow after years of trial and error. Nevertheless, I do persist and most years I’m rewarded with a good crop of beans, lettuce and chard through most of the summer and into fall, and boxes of late-ripening tomatoes wrapped in newspaper in the basement. The last three summers in Calgary have been wickedly difficult for growing hot weather crops. We’ve had frost and snow well into May, summers wetter than I can remember for decades back, and winter galloping in with a vengeance by early October. I was open to any kind of tips on out-smarting Ma Nature or just optimizing the microclimate in my garden. I had confidence in the book before it even arrived. The authors are Donna Balzer and Steven Biggs. 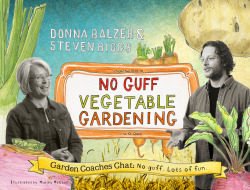 Donna Balzer is a well-known Calgary garden guru, and I’ve enjoyed her gardening advice on CBC radio and in local newspapers and magazines for many years. Steven Biggs is a Toronto gardener with a comparable reputation for straightforward advice. My first impression of the book was that it was a visual feast; big, bright and full of colourful photos and graphics, and somewhat kooky design. I approached this book wondering what it would teach an old gardener like me. In fact, I admit that I approached it wondering why anyone would need a big fat book in order to grow carrots. On my first quick read through the book, I was reminded of how complicated gardening has become in 2011. Any time I flip through a gardener’s catalogue or magazine, it seems to me there are simply too many choices to be made. A novice gardener could be totally befuddled by the plethora of advice on the very basics of soil, crop selection and garden planning, feeding, and tools. Enter “Guff”, the cartoon character who pops up throughout the book to spew dogmatic advice, which the two authors refute in a she says/he says format, not always in agreement but always presenting their opinions in a highly readable and practical way. This is a sensible book that de-mystifies vegetable gardening and takes it back to the pleasurable. The advice is straightforward and makes sense. The topics are arranged from soil to harvest and as hard as I thought about it, I could not come up with one question left unanswered. This is a compendium of basic vegetable gardening knowledge with a whole lot of humour and additional tips. The one complaint I have about the book is around the very thing that impressed me in the beginning, the design. The book is wide and floppy and I found I could only read it if I was sitting comfortably and had it spread on my lap or a table. This is not one to carry around for reading in spare moments on trains and planes. Neither does it lend itself to be carried outside and grabbed up for a quick glance in the garden. I found the numerous fonts and the many columns and sections and mix of graphics and photos throughout a little confusing. If one sits down to read the book cover to cover, the format is fine, but for searching for specific pieces of information, not nearly so effective as a more straightforward presentation would be. But on the positive side of the design, I think that in spite of the detailed and fairly sophisticated information, the graphics and the format would make this a fun book for introducing kids to vegetable gardening. And I remain firm in my belief that every child should know that a carrot grows under the ground and should have the opportunity to poke spinach seeds into the spring soil and watch them sprout. No Guff Vegetable Gardening would make a great family gift, and I think would be happily devoured by anyone yearning for some fresh-from-my-own- garden salad. So goes the Scottish folksong penned by Robbie Burns. And Hope for Humanity, the blood red rose developed by the Morden, Manitoba research station for the 100th anniversary of the Canadian Red Cross in 1995 is to me the embodiment of the kind of love the rose was meant to spread. 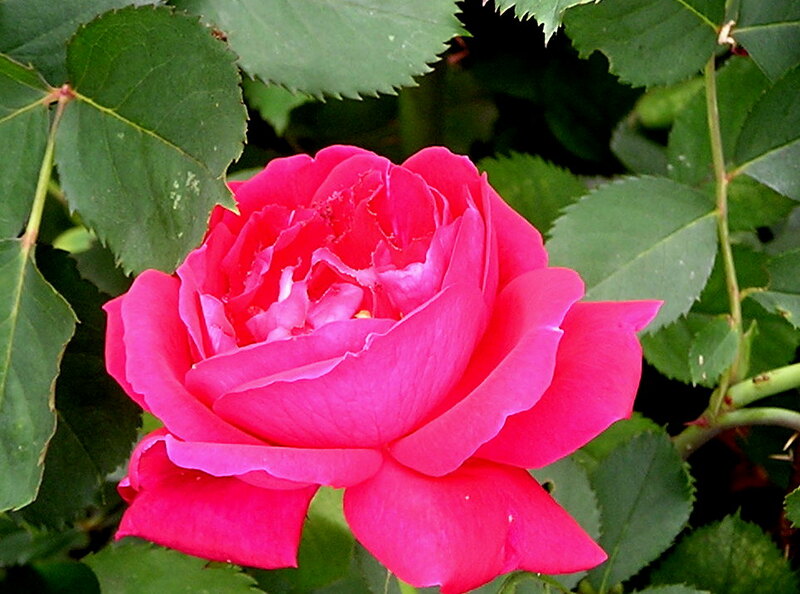 When I bought my HFH rose in 2004, Golden Acres nursery was donating proceeds from the sale to the Red Cross. In 2011, Greengate (formerly Golden Acres) has partnered with the Calgary Homelessness Foundation and is donating the proceeds from the sale of Hope for Humanity to the foundation. I’m going to Greengate tomorrow to buy another Hope for Humanity rose. Seems such an easy and thoroughly pleasurable way to spread a little love around. You need one in your garden too, right? For years I shunned yellow in my garden. Yellow flowers, I had decided, were common and a bit garish. I suspect it was because my mother had a special love of marigolds. Now my mother had a beautiful garden but for reasons I’ve never been able to fathom – I lost my mom so long ago – her garden instilled in me a dislike of a number of annual flowers. I think it may have the style of planting in those years. Her geraniums, marigolds, and Dusty Miller marched up the sidewalk borders in precise lines and perfect repetition; hup, two three, went the scarlet geraniums, the prissy little marigolds and the bloodless Dusty Miller that was to me, the creepiest plant in the yard. She rarely planted white. Why bother, she would have said, when there was such a palette of colour from which to choose. In the first years of my own garden, I filled the beds with perennials from Mom’s garden and my aunt’s huge farm garden near Camrose. 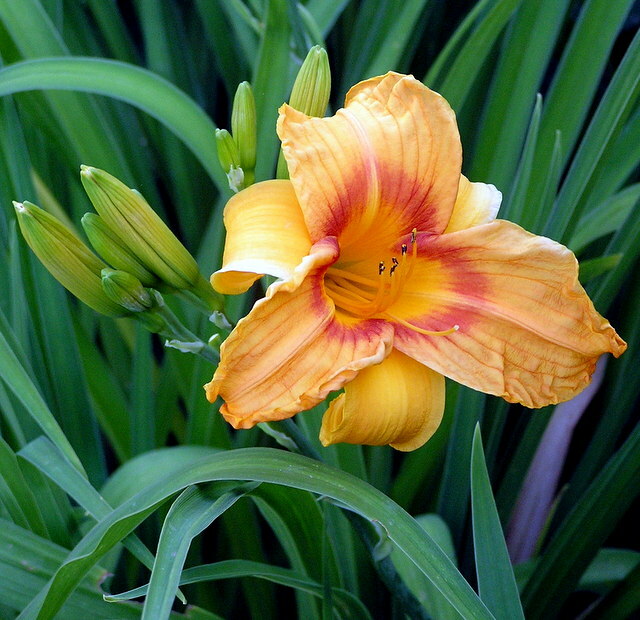 Those plants – peonies, daylilies, irises, delphiniums, monkshood and primula – still bloom in my yard and have been shared with dozens of friends. As I expanded the garden and made room for waves of annual flowers, I choose pastels. I wanted a watercolour of blue and mauve and pink. And I wanted drifts of white for a special gleam at dusk. Lovely. So it went for more than twenty years. Then, about ten years ago, I noticed that one my neighbours had the most splendid splash of sunshine against a brick wall. What were those brilliant golden flowers that lit up her late-summer garden when everyone else’s yard was fading? Heliopsis of course. And in the back yard, she showed me coreopsis. And offered, as all good gardeners do, a little split of each of these in the fall. It would have been rude to decline, I thought, seeing as this was a neighbour I scarcely knew but obviously a kindred gardener. Another five years, another walk, and I came upon the queen of them all – tall, elegant yellow flower spikes atop huge leaves. Growing in a corner so like the shady glade I was cultivating in my back yard. Ligularia. Rolled off my tongue and into the ear of the helpful woman at Greengate Garden Centre and within minutes I was out the door with my prize. And finally, the following year in a dual blaze of interest in cold weather planting (seeds planted in milk jugs and set outside while the snow is still on the ground) and indigenous plants, I ordered a great variety of hardy seeds from Gardens North. We took down a massive spruce in the front yard that spring, and I moved an entire bed of shade plants – hostas, ferns, coral bells – and planted the space with my sturdy little milk jug seedlings with little regard for height or colour or anything at all. Just fill it in for now, I thought and let the new sunny garden have its birth. And oh, it did. 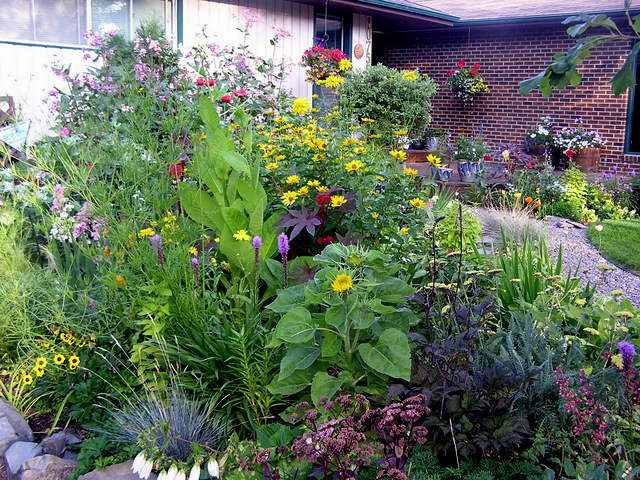 By August that big front bed was a joyous sea of colour and bees and butterlies and hummingbirds. Among the Gardens North seed there was a substitute for one of my choices (undoubtedly something purple) — anthemis tinctoria, native to Alberta. Yellow, but why not, I thought. Three years later, these sunny yellow daisies have spread and they dance and they call to everyone who passes by. What is that yellow flower? One of my favourites, I say. Doesn’t it make you smile?